Samuel Joseph Wurzelbacher, a.k.a. "Joe the Plumber," is the topic of the day on the campaign trail, in part because he held an impromptu press conference Thursday morning in front of his house to discuss tax policy, his disdain for Social Security, and his critiques of Barack Obama. Already, however, there is some dispute as to whether or not Wurzelbacher was being accurate with his critique of Obama. His business, as ABC reports, would almost certainly get a tax cut under Obama's plan, given that he does not expect to make anywhere close to $250,000 in profits. Moreover, for someone worried about his taxes, Wurzelbacher doesn't -- it appears - always pay them. A filing with the Lucas County Court of Common Pleas shows that he has had state tax liens filed against him, meaning he was either delinquent or didn't fully cover taxes that he owed. WASHINGTON — Scrambling to repair his image on economic issues, Senator John McCain proposed during Tuesday night’s debate a $300 billion plan authorizing the treasury secretary to buy the mortgages of homeowners in financial trouble and replace them with more affordable loans. The campaign of Senator Barack Obama quickly countered by saying that the financial rescue plan that President Bush signed into law last week already gave the treasury secretary such power. And, his advisers noted, Mr. Obama recommended such a step in a news conference nearly two weeks ago. Senators John McCain and Barack Obama debated for 90 minutes on Tuesday night before a nation in economic crisis, each promising anxious Americans that he had the better plan and vision to lead the country through what both men said was the most dire financial situation since the Great Depression. Listening to surrogates and aides to John McCain on Thursday, one is left with the impression that there is no great need for Gov. Sarah Palin to actually answer questions during tonight's vice presidential debate. Indeed, the spin coming from McCain surrogates and strategists is that all Palin has to do is pass a sort of artificial personality test, in which she strikes an emotional thread with the average voter -- question, answers, or intellectual capacity be damned. Such were the talking points mere hours before the debate in St. Louis, which peaked with Sen. Joe Lieberman - a man not unaccustomed to the pressures of such a forum - actually proclaiming that Palin's relative ignorance helped her relate to "regular people." Continue reading here. The debate between Senator Joseph R. Biden Jr. of Delaware and Gov. Sarah Palin of Alaska should be fascinating on every level — from substance to style, soup to nuts. The much-anticipated show starts at 9 p.m. Eastern and runs for 90 minutes. We’ll be carrying the video live on nytimes.com and of course live blogging. The whole point of the debate is to see if each of these candidates is prepared to be one heartbeat from the presidency. Look at everything through that lens, from policy prescriptions to body language. How do Ms. Palin and Mr. Biden greet each other on stage? We were mistaken and reported earlier in this space that the debate would be a .............Continue reading here. That was the headline on my latest column, in which I suggested Sarah Palin bow out. Several thousand e-mails later, I can say with some certainty that I hit a nerve. To the GOP base, predictably, I'm a traitor. But what's interesting is how many Republicans seem to take attacks on Palin personally. Moreover, they despise the media so much that they'd rather rationalize Palin's flaws than acknowledge what is patently obvious. 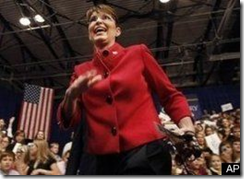 In their view, it is the media's fault that Palin has been rendered incoherent. I don't doubt that Palin is much more articulate on issues with which she is familiar. She is undoubtedly a political talent and a rising star. But she was plucked too soon. Both Palin and McCain are responsible for this unfortunate and untimely debacle -- he for asking her and she for accepting. Obviously, the McCain team knows it has a problem or it wouldn't be shielding Palin from less-structured media encounters. They've brought in their big guns to coach her for Thursday's debate. Perhaps, they will succeed in raising her game. My guess is she'll do better than anyone expects, but that would require only that she speak in complete sentences with subject and verb in their proper order. Continue reading here. Although the fate of tonight's presidential debate in Mississippi remains very much up in the air, John McCain has apparently already won it -- if you believe an Internet ad an astute reader spotted next to this piece in the online edition of the Wall Street Journal this morning. "McCain Wins Debate!" 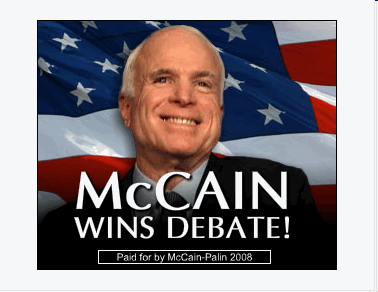 declares the ad which features a headshot of a smiling McCain with an American flag background. Another ad spotted by our eagle-eyed observer featured a quote from McCain campaign manager Rick Davis declaring: "McCain won the debate-- hands down." Continue reading here.